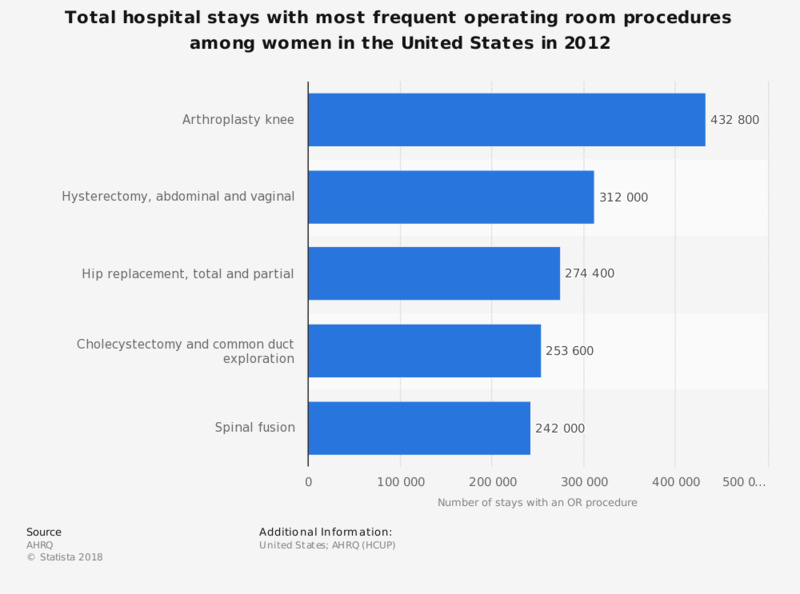 This statistic displays the total number of hospital stays in the United States for most common female operating room procedures performed in 2012. During this year, there were 242.000 total stays with a spinal fusion performed on female patients. Approximately two-thirds of hospitalizations include some form of procedure, although many, like blood transfusions or vaccinations, can be done outside of operating rooms. Costs for hospitalizations with operating room procedures are often much more costly than those without. Includes only nonmaternal and nonneonatal stays. All-listed operating room (OR) procedures were identified using Clinical Classifications Software (CCS) procedure categories. Procedures designated as Other are not reported. Procedures with the greatest change in rate include those with a minimum of 25,000 stays in either 2003 or 2012. CCS 211 (therapeutic radiology) included only one OR procedure: ICD-9 CM procedure code 92.27, implantation or insertion of radioactive elements; this is listed in the table as Brachytherapy (internal radiation therapy).